Quick refills and mobile fueling is made easy with a 28 gallon gas caddy. Designed for the storage of diesel fuel, this caddy meets U.S. Coast Guard, DOT, and U.N. standards or specifications for transporting fuel, When used according to fuel transportation guidelines. 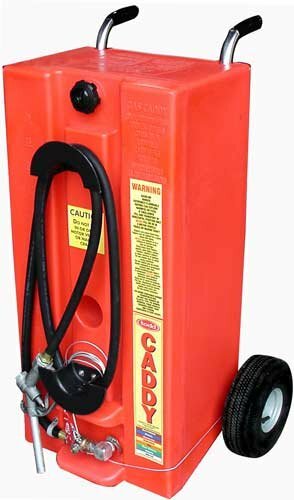 These 28 gallon gas caddies come standard with a ten foot hose, spring loaded nozzle, and pneumatic tires. The molded-in baffles prevent build-up while adding strength and durability to the unit. Whether you are fueling small machinery on site, farm equipment, or military vehicles, this little caddy offers reliability combined with convenience. Easy to move, easy to use! If you will be needing to transfer fuel to some object or location that is above the height of the diesel container, optional pump kits are also available.